Now THIS is a perfect example of the "New Radio" I've been talking about! I've been dreaming about this for a long time... It's an app for both iphones and Android to take you on a tour! I mark out a location and when you enter that location I come on and tell you a story or give you directions. We have just partnered up with a company called Voice Map, which handles all the code programming and the interaction with iTunes and Google Play. My job is to design the tour, write the script and record the audio. But even here, Voice Map doesn't leave you off on your own. They even provide a seasoned editor to help you streamline the script and time the tour to make it work. Our first tour is a driving tour of Carmel-By-The-Sea, California. If you're visiting Carmel anytime soon I would like to invite you to go on the tour with me. For 40 years, Pamela and I have been showing friends and family the secret out-of-the-way places that make Carmel not just a destination but a great story and hence a wonderful feeling instead of just a place. Now with the amazing GPS trigger technology I am able to take anyone who wants to download the app on that same tour. It's a new kind of voice over for me .. I take you on a turn-by-turn Journey telling you wonderful short stories about what you are seeing right in front of you. Voice map has producers and tours all over the world. But this is the first one for the Monterey Peninsula. It's not the last. I love doing this! There is no place quite like the Monterey peninsula. What brought me here in the first place was that it was founded by people who dedicated themselves to the Arts... the tour begins down the path from the top of the hill to the ocean where artists and writers like Jack London used to walk to see the sunset at the beach. That's now Ocean Avenue and it's full of shops, art galleries, wine tasting rooms and hotels. We take you to see the famous doll houses created and built by Hugh Comstock .. Then down to the outdoor Forest Theater which has been showing plays and musicals for well over a hundred years... we detour off Ocean Avenue past the (71 in one square mile) art galleries, the post office where everyone gathers..(no mail delivery, no house numbers in Carmel) to a building that spawned a mayor.. 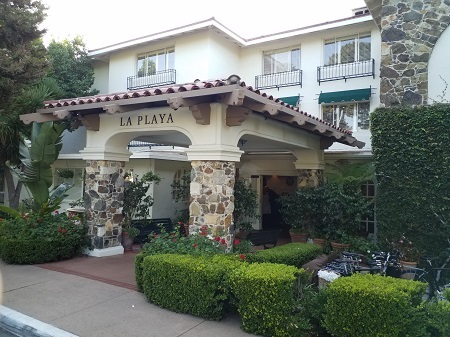 The Hog's Breath built by Clint Eastwood... Then we head past Doris Day's beautiful Cypress Inn and the LaPlaya Hotel where the Mac was introduced and Steve Jobs and staff were tossed out for skinny-dipping in the pool .. The second half of the tour is along the ocean starting with Carmel Beach with views of the Pebble Beach Golf Course and Point Lobos where Robert Louis Stevenson got his inspiration for his book Treasure Island.... We travel along Scenic Drive past Frank Lloyd Wright's only house on the ocean and then two incredible houses built with the rocks from the beach including Tor house, the longtime home of poet Robinson Jeffers. .. Then on to beautiful River Beach, Clint Eastwood's Mission Ranch and finally the Carmel Mission which has stood for well over 200 years. The tour around the "Point" is absolutely breathtaking! The tour takes less than an hour but you can put it on pause at any time and go in and visit places like the LaPlaya or the Mission Ranch and resume the tour after you finished. 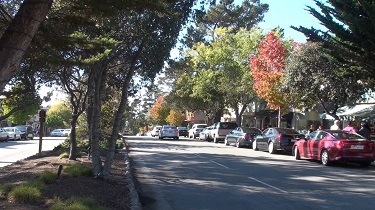 If you are not totally familiar with carmel this is a great way to get the most out of your visit here. Once you take the tour you will not look at it the same way again and realize the depth of the story of this incredible place. For people in the broadcasting industry this is a natural. If you're interested in creating and voicing your own tour app just go to Voicemap.me for further details. 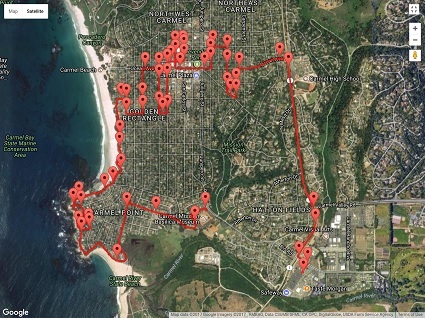 And, if you are visiting Carmel, let me take you on this fantastic tour. Just go to https://voicemap.me/tour/monterey-peninsula/carmel-by-the-sea. on your computer or onelink.to/voicemap on your phone or tablet. The Voice Map app is free and the Carmel Tour costs just $3.99. .
1) Install VoiceMap for iOS or Android by searching the App Store or Google Play, or by going to onelink.to/voicemap. 5) Tap on the price and pay using iTunes or Google Play. The download will begin automatically. Once the downloads complete, VoiceMap will work offline.